According to UBC research published this week in Nature Geoscience, Hawaii’s main volcano chains, the Loa and Kea, have distinct sources of magma and also unique plumbing systems connecting them to the Earth’s deep mantle. This study conclusively relates geochemical differences in surface lava rocks from both chains to differences in their deep mantle sources. By studying lava, scientists can get a better understanding of the make-up of the Earth’s mantle, but this study also suggests that the recent dramatic activity of these volcanoes is related to a shift in the composition and structure of the source region of the Hawaiian mantle plume. So the chemistry of hotspot lavas is a great insight into deep earth evolution. 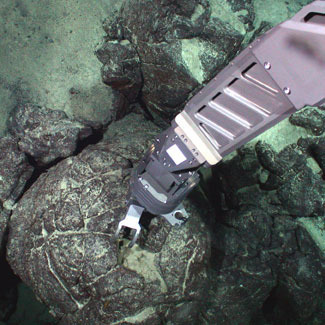 The connection was made by identifying or fingerprinting samples of Hawaiian island lavas that were generated over the last five million years. They collected 120 new samples from Mauna Loa. The next step is to study the entire length of the Hawaiian chain along with other oceanic islands to see if the two trends can be traced further back. The whole chain has lava samples ranging in age from five to 42 million years old. Be the first to comment on "Lava Fingerprinting Reveals Differences Between Hawaiian Volcanoes"